Site Update Feb 01 02: It's been quite recently, but a new wave of material is launching over the next few days. First off, the official website should be re-launched at some point today with extended material. According to touchstone "It will contain some exciting new features including the code to Card #3 that will be 'hidden' in a couple of different places on the site and can be found by 'digging' around." Pictured right: Touchstone sent us a couple of preview screen shots of the new site. Also, this weekend sees the release of a new 30 second teaser trailer, which will be broadcast during the Super Bowl on Sunday. 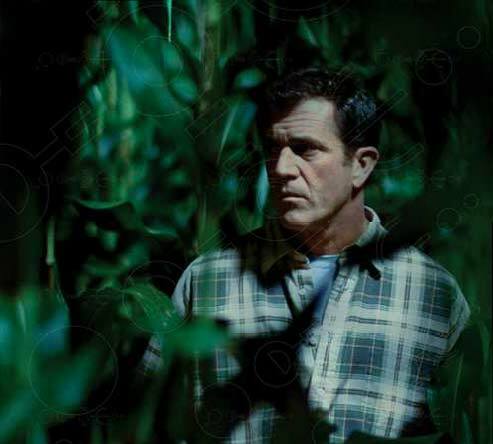 If you've got a satellite dish you'll be able to view both the trailer and a minutes of bonus material featuring Shyamalan talking about the movie and crop circles: February 3, 2002 / 8:00 - 8:15 PM (Eastern Time) / Telstar 5/ [c] 09 / Downlink Frequency: 3880 Vertical / Audio: 6.20/ 6.80. Thanks to Drew. Site Update Jan 12 02: There's a rather quaint article in the Courier Times today which is a Bucks County local paper all about "Mom's Bake at Home Pizza" which was one of the locations in Newtown Boroughs that was used in the movie. It was transformed into "The 2 Aldo's" for the shoot. Site Update Jan 11 02: For all those in the UK, just heard that the movie is slated for release over here on, wait for it.... Friday 13th September, ooh er! Well, this should fuel some speculation, and if true it's the "Signs" spoiler to end all spoilers, so be warned. One of our anonymous tipsters has pointed us to a website that professes to reveal the surprise ending of the movie, we've no idea if this is legit or just the product of someone's over active imagination, so caveat lector! But, If nothing else the way they reveal the twist is amusing... view the site. Fancy getting your hands on one of the pre-release posters (pictured right), well, we've noticed that several of them are now cropping up on auction sites such as ebay. You should be able to pick one up for around $9.00 / £6.40 (approx). 2001 has been described as a dismal year for Disney, but a recent letter from CEO Michael Eisner to shareholders indicates that they are pinning their hopes on "Signs". 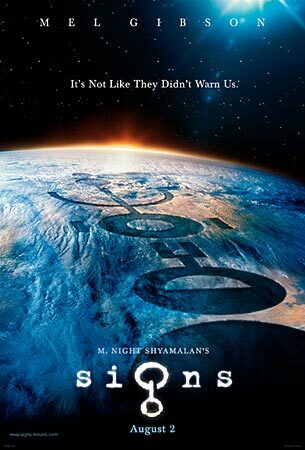 It's touted as one of their high profile projects for 2002, and they're hoping Shyamalan will - once again - deliver box office gold for them... let's hope so, as nobody around here wants the movie to bomb! Site Update Dec 28 01: How about a game of spot the difference. 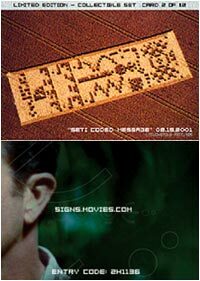 Looks like the early promotional material for the film such as the teaser poster and postcards were printed before the crop circle used in the movie was created. If you look at the diagram used in the promotional teaser poster and postcards (pictured right on the left) and compare it to the completed formation featured in the trailer (pictured right on the right) there's a circle missing from the top of the formation! Looks like they made the formation too close to the edge of the field and ran out of crop, whoops! Doing what any circlemaker would when things don't go quite as planned they improvised and decided to put the missing small circle to the right of the large circle at the base of the formation. It will be interesting to see if they alter the diagram used in any future promotional material to fall in line with the completed crop circle. We've been sent a copy of the completed puzzle image that has already been partially revealed on the official site. It's very similar to the official still put out by Touchstone a couple of weeks ago. Click on the image pictured right to see a larger version. 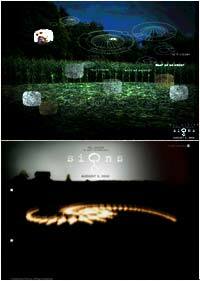 Site Update Dec 27 01: We've added a new article "Trailer talk" which takes a closer look at the crop circles depicted in the teaser trailer. There was an article about the trailer in a recent issue of the Tri City Herald newspaper. News Update Dec 21 01: I've had calls from a couple of journalists today, so if you're based in the UK look out for coverage of the movie in the Sunday Express and The Times newspapers this weekend. WARNING: Just a quick note to warn anyone who did manage to download any of the 12 behind the scenes interviews with Night Shyamalan that disney inadvertently left on their server (oops! see below), distributing those files via the web, e-mail or any other means is illegal and if you do so disney's legal team are sure to be in contact with you. Now, I wonder how I know that? To late, as predicted, they've been removed! These 12 movies give the first real insight into the form of the movie. Lot's of details and it's all sounding very promising! The first wave of publicity for the movie continues today with the release of the first teaser trailer. You can view it now online over at the official site. It made me feel slightly uneasy which is a good sign, no pun intended! We've now replaced the stills we took from the "Entertainment Tonight" feature with ten stills taken from the teaser trailer. We've just received the second postcard and access code, which enables hidden content on the official site to be unlocked, (pictured right) the code is 2H1136. Here's a link straight to the hidden content. We're told that the card won't be available until Jan 2002. You'll be able to pick it up at the following conventions in the US: Slanted Fedora Con, January 3-5, New York, NY. Annual Star Trek Convention, January 12-13, Portland. LA Science-Fiction Convention, January 13th, Los Angeles, CA. Star Trek, Xena convention, January 19-20, Chicago, IL. News Update Dec 18 01: After a quite couple of weeks, the first wave of publicity for the film is about to kick in, see below! For starters, here's a first look at the official poster for the movie, pictured right. Click the image to get a larger view. The poster has the ominous tag line "It's not like they didn't warn us"! We've just been sent a couple of official movie stills from Touchstone Pictures, you can find them in our "About the movie" section. Details of the photos are pictured below, © Touchstone Pictures. There's a great article about the movie in today's "USA Today" newspaper.